In the (slightly) hotter weather wearing foundation can be a bit of a pain in the bum. If you apply it too thickly it can melt off your face quicker than you can say ‘I fancy a Twister’ so you look worse than how you would’ve without it in the first place. Tinted moisturisers are a saviour in this instance as they give you a little bit of colour without being too heavy. 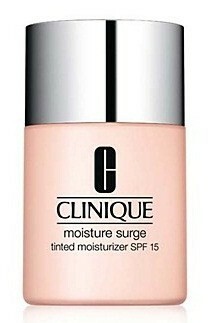 Clinique’s new Moisture Surge Tinted Moisturiser brings the benefit of an SPF moisturiser with a hint of colour, to go a little way towards covering imperfections and creating an even look. The formula is extra light and malleable, meaning you need one small squirt to cover the whole of your face. The tinted moisturiser doesn’t drag and absorbs in only a few minutes, meaning you can apply your makeup as usual over the top. The only thing I would advise is that you leave it for about ten minutes if you’re applying powder (or blush/bronzer) as there can be some sticking and create a blotchy patch, which doesn’t look good on anyone! It lasts all day and blends well with other makeup, as well as being light enough to feel like there’s barely anything there. This isn’t exceptional and it doesn’t do anything radical, but it is a really nice daily product that will be getting me through the summer days… possibly even the summer nights. RRP £21.50 and available in six shades from Clinique counters nationwide. I also got a sample in Glamour and although I really liked it, I think it's way too expensive for Clinique! For £21.50 you get only 30mls, whereas Bobbi Brown (also owned by the same company, Estee Lauder) has a new oil free tinted moisturiser with a very simiar description selling at £27.00 for 50ml. AS much as I like Clinique – when on earth did they get so much more expensive than Bobbi…?! I know what you mean about it being pricey, but you do only need a really small blob so it lasts for a long time. It's all swings and roundabouts though with companies and brands!